Reverberations | Is Yoga Not Even a Hundred Years Old? Is Yoga Not Even a Hundred Years Old? In 2009, the noted Dutch anthropologist (and New Directions in the Study of Prayer Advisory Committee member) Peter van der Veer published, in the journal Social Research, an article devoted to explaining the origins of modern spirituality. Committed to Talal Asad’s call for an “anthropology of secularism” and riding on the coattails of Charles Taylor’s Secular Age, van der Veer argued that modern spirituality first emerged in the West during the second half of the nineteenth-century, as an alternative to traditional religion fueled by the “secularization of the western mind.” In search of alternatives to institutionalized Christianity, the nineteenth-century witnessed the rise of various movements—Transcendentalism, Christian Science, Theosophy—hoping to discover a universal spirituality agreeable to the modern intellectual palate. The desire to look beyond the conventional in pursuit of the spiritual, according to van der Veer, was enabled by western imperialism, which paved the way for Euro-American encounters with Indian and Chinese spiritualities. These were eventually reimagined and transformed to go beyond the dogmatism of Christianity. Engendered by the interaction between metropole and colony, the oppressed and the oppressor both played a part in the creation of a new spirituality—thus van der Veer’s startling conclusion that modern spirituality is incomprehensible apart from the expansion of European power. This, like much of the recent literature devoted to the anthropological turn to the secular, also suggests that contemporary notions of spirituality and religion are rooted in the not-so-distant past. A recent Der Spiegel piece by Manfred Dworschak, entitled “Salvation Without a Savior” (Erlösung ohne Erlöser), nicely illustrates how van der Veer has recently applied these insights to the history of yoga in North America and Europe. The first half of the article centers on the significance of Swami Vivekananda’s speech at the 1893 World’s Parliament of Religions in Chicago. Van der Veer has covered some of this ground before. 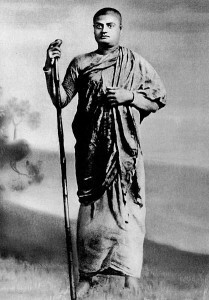 Vivekananda made it his life mission to tout the religious ideas and practices of his wildly popular guru Ramakrishna (a practitioner of tantric yoga). The challenge in doing so involved Vivekananda’s attempt to moderate the message of an illiterate priest serving in a temple dedicated to the Goddess Kali by whom he regularly became possessed. As a member of the westernized elite, Vivekananda thus hoped to soften the highly eroticized tantra of his guru for the modernizing, middle class in Calcutta. The message was a sure hit—Vivekananda had stolen the show. For years after, he traveled the U.S. giving lectures and attending dinner parties. Yet lost in all the hoopla, according to van der Veer, is that the ancient spirituality Vivekananda proclaimed had never, in fact, existed. Vivekananda, clever enough to understand his audience, invented it. As Dworschak puts it in Der Spiegel, Vivekananda created a pure ethereal spirituality that existed only in his imagination: a product tailor-made for Chicago, for the West. The enthusiasm of his audience agreed. What we see today in Asian spirituality, says van der Veer, is Vivekananda’s doing. And by importing a worldview that met the spiritual needs of the Enlightened West, Vivekananda should be recognized as a key figure of Western modernity. Still, at the beginning of the 20th Century, very few Indians would have been familiar with anything now taught in Yoga studios and courses worldwide. Even Vivekananda turned sharply against the emerging practice of using Yoga for the gym. His spirituality entailed an intellectual project. 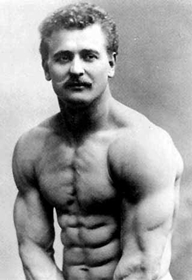 It was actually Eugen Sandow, a native of East Prussia typically viewed as the inventor of modern bodybuilding, who played a pivotal role in the development of contemporary Yoga practices. Sandow’s attraction to Yoga led him to visit India in 1905, where his chiseled physique impressed and influenced the emaciated yogis he encountered. His body sculpting techniques were soon being emulated by yogis everywhere. Van der Veer provides a series of other stories in this vein that attempt to show that Yoga as we understand it today is anything but an ancient Indian spirituality. In India itself, the new spirituality was greeted with ambivalence. “Ordinary Indians had nothing to do with it,” says van der Veer. “They always stuck to their old gods.” This was not the case for the middle class, who believed that Vivekananda’s teachings had conquered the world. “They said to themselves: If the rich West is enthusiastic about Indian spirituality, then we can well be proud of it.” In this way, Indians rediscovered their “ancient tradition”: as a re-import from the West.